Why do we recommend managed WordPress hosting? Because you want to build your site, not manage a web server. You need a partner who’s an expert in both hosting and WordPress itself. Someone who will pick up the phone when you call and actually tackle your problem – whether it’s with WordPress itself or on your web server. You already know you need a WordPress site that loads fast, and handles all the visitors you’ll one day get. A site that stays up under the heaviest of loads, deflects the many daily security attacks WordPress sites see, and provides an excellent foundation for the hard work of creating content and engaging visitors. By now, you’ve likely determined that WordPress is the right solution for your needs. But you might not know exactly how to make WordPress and the underlying server software stack work for you. It takes serious technical knowledge to get WordPress to stay up and stay fast when your website finally succeeds. And that’s why at WP101 we both use and recommend managed WordPress hosting. So Why Choose Managed WordPress Hosting? Fast sites convert traffic to revenue more effectively and rank higher in search engines. Speedy sites deliver better experiences to visitors, which in turn, leads to happier, more engaged visitors. WordPress sites can become slow for any number of technical reasons. Managed WordPress hosts actively monitor these factors, making continual optimization improvements. Managed hosts create an infrastructure that makes WordPress fast – even under the heaviest of visitor loads. Every minute, silent armies of robots are crawling the web, looking for sites to break into and bend to their own nefarious purposes. They try passwords, look for outdated themes, plugins, and core code, and pore through thousands of sites every hour. While you might ask yourself “Who would want to break into my site? I’m not the government or a company,” that’s not how hackers think. These bad actors seek to turn your website into a spam-sending, botnet-controlled, malware-distributing machine. And you might not even know about this until one day someone tells your website has begun to look like a fly-by-night pharmacy. By that time, your whole site is often not just defaced, but left with backdoors for bad actors to return anytime they want. Managed WordPress hosts work heavily on security, and take care of hardening WordPress and looking for new vulnerabilities on your behalf. And if you do get hacked, some of them (like WP Engine) will fix it for you for free, and restore your site back to its former glory. After months of hard work on your site, there will come a time when it all pays off – you finally get featured on that big media site, make the homepage of Reddit, or rank number one for that keyword. Thousands of visitors come to your site in a matter of minutes. Hooray! Fame and fortune are closer than ever before. But this is exactly when most websites fail – just when your site is its most popular, the crush of visitors overwhelm the server and the site goes down. New visitors are shown an error message or a blank screen. And after months of hard work, your web host has turned success into failure. Managed WordPress hosts can scale your site’s traffic automatically to serve hundreds of thousands of simultaneous visitors – so you’ll avoid the dreaded “Error Establishing a Database Connection” error message when you finally hit that front page of Reddit, CNN, or your favorite publication. Many hosts support only their own server hardware – so when your site goes down or shows errors, they simply tell you the server is fine, and throw the responsibility back to you. Unless you want to become a systems administrator, this is confusing, frustrating, and flat out irritating. Managed WordPress hosts, by contrast, employ experts in not just servers, but also PHP, MySQL, and WordPress itself. Their support lines are staffed by WordPress experts, so their team can help you troubleshoot issues at every level of your website’s software stack. While every managed host trains their support team differently, my friends at WP Engine make sure each and every one of their support team members goes through months of training, so they can fix minor issues before they become major problems. If your site is hosted by a managed WordPress host, you’re already covered. They handle it for you, automatically backing up your site every night. If anything goes wrong, you can simply restore your site from a backup with just a couple of clicks! But managed WordPress hosts don’t stop there. They also automatically update your site to the latest version of WordPress whenever a new version is released, ensuring you’re always up to date and secure. WP Engine even includes a feature called “Automated Upgrade Protection” — which first creates a complete backup of your site. Then they perform the upgrade. As soon as the upgrade is complete, they test the site to make sure your site is loading as expected. If the site loads without any detected problems, you’ll be notified that you’ve been upgraded. But if something appears to be off, they automatically roll your site back to the previous version, and investigate what might have gone wrong. All of this happens without any intervention required from you! Managed WordPress hosts obsess about making your site fast, secure, and available, so you can focus on making your site great and your readers happy. 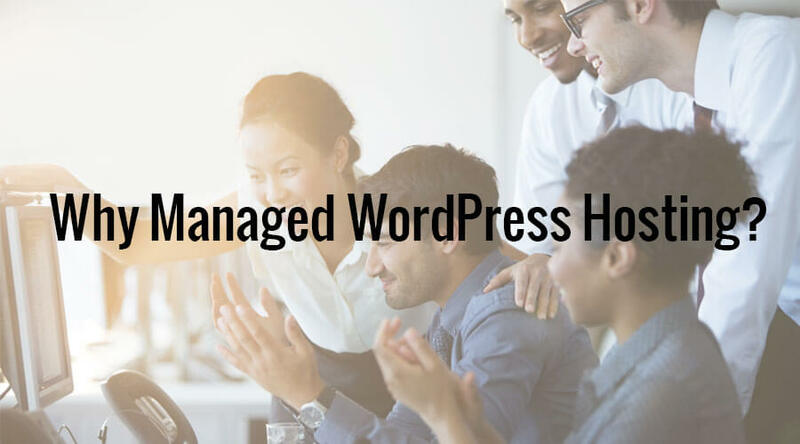 Check out the complete list of managed WordPress hosting companies we recommend. Which WordPress Host is Right For Me? Hi, Shawn. It’s really a great pleasure to read your detailed post regarding why we need managed WordPress hosting. Yes, you are right that managed WP hosting allows us to concentrate on our own tasks instead of doing technical tasks. Moreover, managed WP hosting providers also provide speedy sites, better experiences to visitors, instant support, extra security and the like. Thus I also recommend fully managed WordPress hosting. Managed WordPress Hosting is totally worth it in my opinion. You get the peace of mind knowing that you site is being taken care of. We recently moved all our clients sites to StackPress, and it’s the best decision we could have made. Hi Shawn, I completely agree with you on this – “Managed WordPress hosts obsess about making your site fast, secure, and available, so you can focus on making your site great and your readers happy.” Having a managed hosting will let you focus on UX and UI, especially on the content! Well done for this wonderful article!